Ben Jacobs is eyeing 2019 with great optimism after finally getting to the bottom of the health issue that sidelined him for the second half of this season and finalising a new two-year deal with North Melbourne. Jacobs, 26, who was due to come out of contract at the end of October, told AFL.com.au he was rapt to have re-signed with North until the end of 2020. 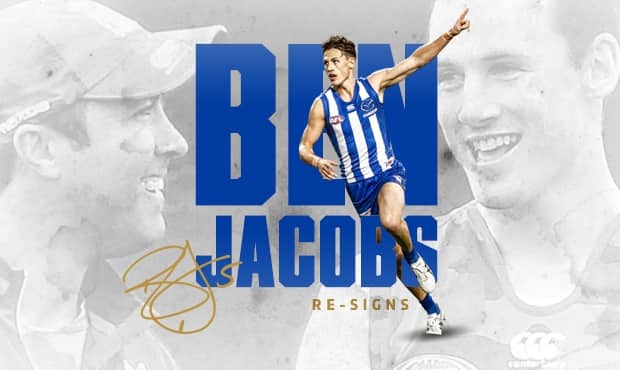 Jacobs' new deal comes after a 2018 season in which he again demonstrated how vital he is to the Kangaroos' midfield balance as one of the competition's best run-with midfielders, but also when injury again sidelined him for an extended period. After recurring foot injuries sidelined him for most of the previous two seasons, Jacobs returned to play North's opening 12 games this year, quickly re-establishing himself as a key member of its midfield. Resuming the run-with role he had made his own in 2015, Jacobs blanketed opposition stars such as Dustin Martin, Patrick Cripps, Tom Mitchell and Clayton Oliver as the Roos made an 7-5 start to 2018 that had them seventh on the ladder. 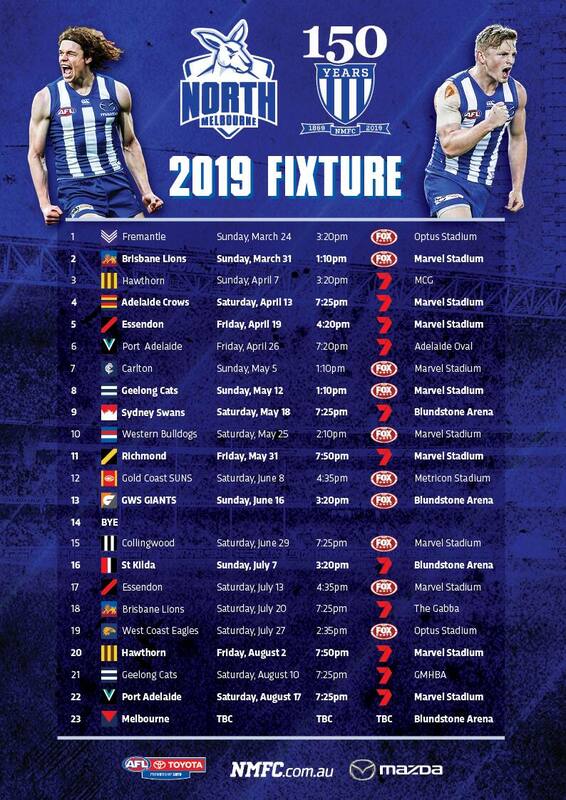 However, Jacobs missed all bar one game following round 12 due to the after-effects of a head knock he suffered in the Roos' round 11 win over Brisbane. For a long time it was thought he was suffering concussion symptoms, as he was feeling "pretty run down and a bit foggy in the head … a lot of the stuff that kind of looks like a concussion". But Jacobs said on Thursday doctors had finally diagnosed his condition as chronic sinusitis and he expected to make a full recovery after a recent operation, which should have him fit for day one of the 2019 pre-season. "It was a perfect storm in the end with a knock I took against Brisbane. I kind of hit my head and had a bit of a neck injury at the time and a nose injury, but in the end I probably put it down to a sinus problem," Jacobs said. "I had chronic sinusitis, which I got cleared up about six weeks ago. The doctors had to do their due diligence and couldn't really just rule out the concussion-type symptoms, but it was all to do with the nose, so concussion is not the problem at all." Jacobs said watching his teammates from the sidelines in the second half of the season was frustrating, especially when he was considered close to a return for much of that time and was a late withdrawal from North's selected team on several occasions. "It was something that I think everyone else externally can kind of thought, 'What's going on?' But we were quite in control, it was just one of things we had to leave it until late every time (before deciding whether I would play)," he said. Jacobs has resumed training, but says he is "just building up slowly" after being unable to do much work recently. He is fully confident his foot problems of 2016-17 are a thing of the past, saying they had not given him any problems at all this season. He also takes a lot of confidence from his form at the start of 2018 after 18 months on the sidelines. "It was good to be back, and I was just enjoying footy again. We were winning and playing well, so it was a good start to the season" Jacobs said. "Obviously it was a frustrating finish, but it wasn't to do with the foot and there's no major injury, so it's not the end of the world." Most of all, Jacobs is grateful for the faith North and senior coach Brad Scott have shown in him over the past three seasons when he has been restricted to just 20 games. "I've never once had to worry about the contract when I've had so much time off with injury. It's one of those things where it's great to have that support, especially from Brad, who's been amazing," he said. "It's let me put my health first and not have to make a decision based on, oh, I need to get back to prove myself. That's never been a question. "So, I've been very lucky in that way." Jacobs has played 64 games for North since crossing from Port Adelaide at the end of 2012. He finished seventh in the Roos' best and fairest award in 2015 after taking on run-with roles for the first time in his career that season.